Health professionals have an important role in ensuring that clients are aware of evidence-based options for smoking. Free online training is available on the Quit website and down below. For many clients, a brief intervention by health professional combined with pharmacotherapy (nicotine replacement therapy products or quitting medication) plus coaching (such as Quitline) will given them the best chance of quitting. 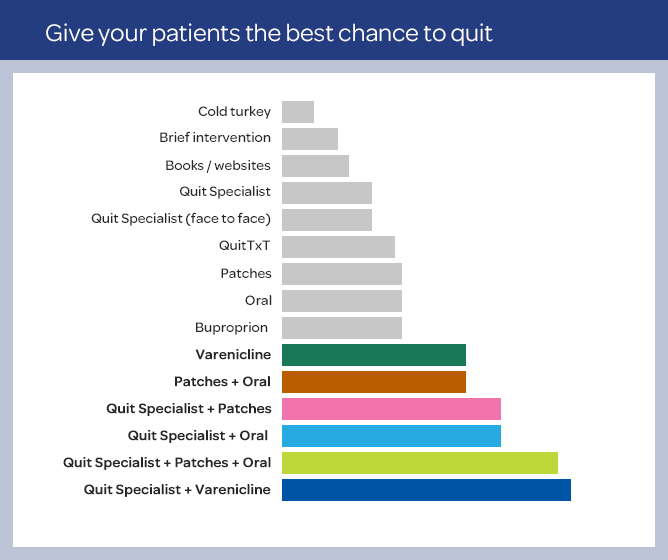 The success-o-meter can be used to discuss options to quit with your client. Our Quit Specialists have the experience and resources to help people to stay on track. People who call Quitline are more likely to quit for good. Quitline offers a free call-back service. They can call patients before they quit, to help with planning, as well as booking in calls at pivotal times in the weeks after they have quit. Refer clients to Quitline or via fax. Learn more here. Whether it be stronger heart, better breathing or improved mood, smokers love to hear about the benefits of quitting. A health professional can help a smoker understand their addiction. For most smokers, it is helpful to think of smoking as having two elements: the physical addiction to nicotine (when we need a cigarette) and then there’s the emotional or situational triggers (when we want a cigarette) such as stress, alcohol or a work break. You can use our 'Build Your Plan' tool to help clients assess their level of nicotine addiction, identify triggers and use strategies to manage their cravings. All health professionals, in all types of roles, whether working in the community or hospital settings, individuals or groups, have the potential to support people to become smoke free. Learn what you can do to support your patient/client/consumer to quit.